Germany’s Kriegsmarine officially added heavy cruisers to its fleet planning after the Anglo-German Naval Agreement of 1935 allowed construction of such ships. Unilaterally, the British had erased the provisions of the Versailles Treaty, which forbade German cruisers with main guns larger than 150mm (5.9-inch). Once the naval provisions of Versailles had been swept away, German Chancellor Adolf Hitler believed the political, economic and military clauses would follow (correctly, as things turned out). The type did not really fulfill any of the fleet profiles proposed by the naval staff’s various and bitterly-opposed factions. But Adolf Hitler had wrung the right to build such ships out of the British, and believed it politically important to follow through with the concession. Building the ships would show the world that Germany had broken its diplomatic isolation and put the limits of the Versailles Treaty firmly in the past. The agreement with Britain allowed Germany to build 50,000 tons’ worth of heavy cruisers: five 10,000-ton ships armed with 8-inch main guns. Design work had secretly begun in 1933 for a ship that could match the new French Algérie, then in the final stages of construction at Brest and seen as the best-designed “Treaty cruiser” to date, with a good balance of speed, protection and firepower. The Kriegsmarine placed orders for two ships in 1934, well before Hitler had even offered to discuss an Anglo-German naval agreement. The talks began on 4 June 1935 and lasted two weeks, with a signing ceremony on the 18th. Blohm & Voss laid down the first cruiser, Admiral Hipper, in Hamburg on 6 July. Deutsche Werke in Kiel laid down a sister ship eventually named Blücher on 15 August. Rear Admiral Werner Fuchs, head of warship design, instructed his architects to give the new cruisers lines similar to those of German battleships so that enemy spotters would be unsure of their type. The new cruiser outwardly resembled Algérie, with eight 8-inch (203mm) guns in four double turrets. These would be the only ships to carry this weapon, a very modern design with excellent range and accuracy – which should have been expected, given the unusually large spaces devoted to fire control and gunnery directors. While the guns themselves were quite good, the ammunition was another story. As with the ammunition for German battleship guns, the 8-inch armor-piercing rounds had a remarkably high failure rate – during the Battle of the Denmark Strait the British battleship Prince of Wales was hit by seven German 8-inch and 15-inch shells, only two of which exploded. One of the duds, an 8-inch round from Prinz Eugen, penetrated a shell-handling room and could have proven catastrophic had it actually gone off. No secondary guns were included in the design – Germany did not field a true dual-purpose gun until very late in World War II – and the cruiser’s next-heaviest weapons were a dozen 105mm heavy anti-aircraft guns plus a dozen 37mm and a varying number of 20mm light anti-aircraft weapons. Late in the war the Germans purchased the more-effective Swedish 40mm Bofors anti-aircraft gun (the same weapon fitted to U.S. Navy warships) to replace the disappointing 37mm weapons. To make up for the lack of a secondary gun, the cruiser carried a dozen deck-mounted torpedo tubes plus a full set of reloads for them. The hull design drew heavily on that of the last German light cruiser, Nürnberg, which launched in December 1934, but was much longer and wider with a considerably deeper draft. Displacing over 14,000 tons, Admiral Hipper was a huge ship for her type, larger than any other heavy cruiser built until the American Des Moines, which commissioned after the end of World War II. Like other Treaty cruisers, Admiral Hipper had at best nominal protection – less than Algérie or the Italian Zara class, but considerably more than the British “tin clads” of the County class. Nürnberg had a mixed power plant with both turbines for bursts of high speed and diesels to help extend her range. Admiral Hipper had no diesels, only turbines with very advanced high-pressure-steam boilers, which proved troublesome throughout the service lives of all the ships in the class (at least those that remained in service for any length of time). That gave her a great deal of power – 133,000 horsepower for Admiral Hipper, somewhat more or less for her sisters – for a speed of 32.6 knots. Yet the design didn’t turn all that power into a tremendous speed advantage: Algérie made 31 knots on 84,000 horsepower while Zara hit 32 knots with 95,000 horsepower, and both had much greater reliability, making them available for missions more often. The Kriegsmarine ordered a second group of three cruisers in 1935, to flesh out the full allotment of five ships. Each ship differed slightly in their particulars; even their hulls were of slightly different dimensions. 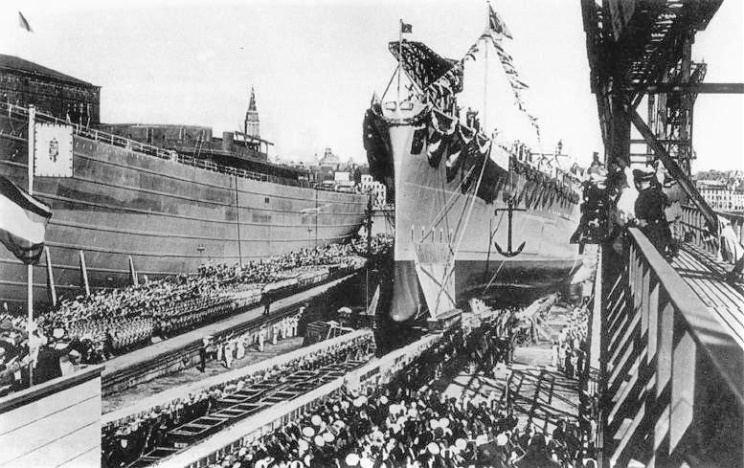 The third ship, Prinz Eugen, was laid down at Germaniawerft in Kiel in April 1936. Seydlitz followed at Deschimag in Bremen in December of that year, and Lützow, also at Deschimag, in August 1937. Prinz Eugen hits the water in Kiel, August 1938. The Second London Naval Treaty of 1936 called for an end to construction of cruisers armed with 8-inch guns, and Hitler, unwilling to tear up the Anglo-German Naval Agreement, told his Navy to comply. Seydlitz and Lützow were therefore re-designed to carry a dozen 150mm guns in place of their original main armament (Prinz Eugen had been laid down before the treaty’s cutoff for heavy cruiser construction). Informed that the new turrets could not be made ready for installation until the summer of 1941 (five years later! ), Hitler rescinded the order and manufactured an excuse about Soviet cruiser construction. Seydlitz and Lützow, though delayed by the indecision, were constructed as heavy cruisers from the start. Grand Admiral Erich Raeder tacked the cruisers onto his Plan Z list, but like other German heavy ships of the pre-war period (Bismarck and Scharnhorst) their painfully slow construction was driven by political rather than military needs and they were not truly part of Plan Z. None of the cruisers were in service when war broke out in September 1939. Admiral Hipper had joined the fleet in April 1939 but returned to the shipyard in June to have her funnel cap and bow replaced, work that lasted into 1940. Her sister Blücher commissioned in late September 1939 and spent the next six months working up her new crew in the Baltic. Both cruisers participated in the April 1940 invasion of Norway; Blücher was sunk by a shore-based Norwegian torpedo and Admiral Hipper rammed and damaged by the British destroyer Glowworm. Engine problems and other repairs kept Admiral Hipper in the dockyards; she shot up an unprotected Allied convoy in February 1941 but had limited success as a commerce raider due to her relatively short range compared to diesel-powered raiders like the Deutschland-class armored cruisers. She later spent an entire year out of service at the height of the war, recommissioning for Baltic service in late 1944 and finally being put out of action by British air attacks. 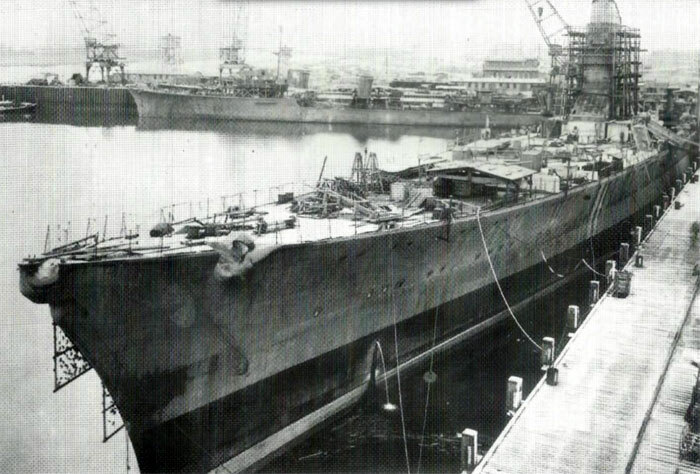 The Soviet Union attempted to purchase all three ships of the second group; the Germans balked and finally agreed to sell one of them, the incomplete Lützow. Prinz Eugen commissioned in August 1940 and undertook her first mission alongside the battleship Bismarck into the North Atlantic. Engine troubles and damage from air attacks limited her operational availability, and after she participated in the “Channel Dash” of February 1942 back to Germany she spent most of the war’s remainder either under repair or in the Baltic Sea. She became an American prize after the war and was expended in the post-war atomic bomb tests. Workers removing the upper works from Seydlitz for carrier conversion. Despite repeated stops in her construction, Seydlitz was approaching completion in August 1942 when orders came to tear down her superstructure and rebuild her as the aircraft carrier Weser. That work ended in June 1943 and she was towed to Königsberg and laid up. When the Red Army approached in January 1945 she was scuttled. The Soviets raised her and claimed her as a war prize, apparently in hopes of salvaging materials that could be used to complete her sister Lützow, and later scrapped the hulk. Like most of the Kriegsmarine’s efforts, the heavy cruiser program can be judged a failure. The five extremely expensive ships gave little useful service thanks to their overly-complicated power plants and extended building times. Built to achieve political ends, they failed in that regard as well (the Anglo-German Naval Agreement did nothing to keep Britain out of the war four years later). The Kriegsmarine had never asked for heavy cruisers, and had no place for them. 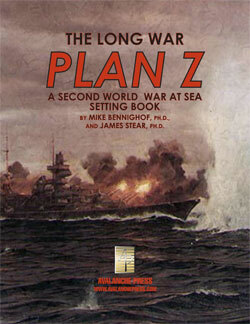 The three ships of the class that have not appeared in other Second World War at Sea games as yet - Blücher, Seydlitz and Lützow - are all found in Second World War at Sea: Plan Z.